Those weren’t his words, of course, but they convey the essence. Isaiah’s actual words leave me reeling. Public humiliation. Burning. Unquenchable thirst. Thirty-one verses of too-harsh truth paint a dire picture of the future. I don’t want any of what Isaiah predicted in his opening chapter. The next chapter is more of the same, but sandwiched in between a description of crushed sinners and the need to hide under a rock because of the judgment to come is a little oasis of words. 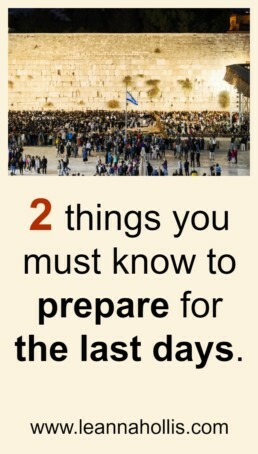 In the last days, Isaiah tells us, everyone will want to go to God’s house. They won’t be there to be seen or show off their new outfits. It won’t be the “in” thing to do before lunch at the country club. Instead, many people from all over the globe will stream to the house of God because of one very important reason. They want to learn God’s ways in order to obey. We don’t always go to the house of God to learn His ways in order to obey now, do we? But one day we will. Consider the last days for a moment. No more weapons, no war, no conflict. That’s quite a change, isn’t it? I long for that day, yet I confess I’m not ready. I’m not yet full to the brim with the fruit of the Spirit. There are days when pride or anger or judgmental, critical spirit raise their ugly heads and speak through my mouth. I’m probably not the only one with a little not-like-Jesus in me, but I want to be rid of all the old sin so I can be ready for those last days, don’t you? As we prepare for the coming of the Christ child this Advent season, let’s take it a step further. Prepare our hearts for the future, too. Diligent Bible study. Open our Bibles and allow God’s words to cleanse and transform us. Learn God’s ways. Surrendered obedience. Once we know what God wants, we must choose to obey. Learn what God expects and do it. It’s that simple. It’s that hard. Leannahollis.com is a participant in the Amazon Services LLC Associates Program, an affiliate advertising program designed to provide a means for sites to earn advertising fees by advertising and linking to amazon.com. This blog post contains affiliate links, which means if you click on the link to make a purchase, I may make a small amount of money (usually a few cents) from your purchase. It will not increase the price you pay in any way but it will help support the cost of the website.